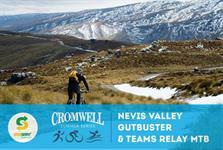 The Nevis Valley Gutbuster (formerly Bannockburn Gutbuster) is a chance to test your fitness limits with a 75km endurance ride through the iconic Nevis Road from Garston to Bannockburn. Past the Ben Nevis Station and sheepyards (your only comfort station on the trip! 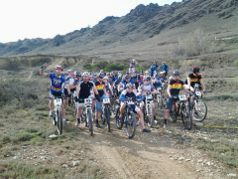 ), riders reach the Nevis Crossing Bridge, some 52km from the start and at 660m above sea level. From the bridge, riders face another gutbusting ride up to Duffers Saddle at 1300m (gradient 1:12), then another 8km steep downhill on a good metalled surface, to the Nevis turn-off. The sealed road to Bannockburn is an easy 5km to the finish line at the Bannockburn Hotel at 252m above sea level.